While coming to work this morning oxen (castrated male) cart carrying sugar canes caught my attention. It is not a common site to see a bullock cart or hand pulled cart (pulled or pushed by a man) at the heart of Mumbai city next to VT Station. 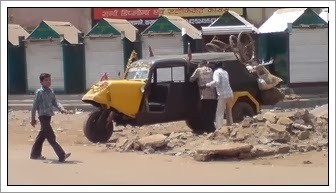 They are not allowed in the main roads of the city but can only move in the peripheral roads of the city. These kinds of slow moving objects cause most notorious traffic jam in India. But for poor villagers, these are the only way to meet their daily needs and feed few hungry stomachs. Revealing the very true fact of economic and emotional hardship that these low-wage workers face on a day-to-day basis. Cart is being used for ages and still continues to be an important mode of carrying goods mostly agrarian goods even in this modern age. Although, its popularity has declined considerably but it is very cheap than any other mode of carriage vehicles. It has many shapes but the basic idea of transporting material remains same. It has usually two or four wheels. This cart is made entirely of bamboos and the wheels are wooden. It is also a very eco-friendly vehicle. Number of men or animal required to push or pull depends on what being hauled. "India is changing" I am sure this is not a new topic to talk about. But there are few things which got changed in India which my RADAR didn't notice before. I am not going to debate on their pros and cons. Any changes are more noticeable when we encounter the same old place or person after a break. Like you meet up an old friend with whom you grew up but that time probably you did not noticed he or she was growing vertically and your mid- aged relatives were growing horizontally. But you meet them after few years the changes become more noticeable to our eyes. This time, while passing in front of AIMS, Delhi I could not believe my eyes the whole place changed for good the landscape is now full of flyovers. Well, Delhi being the drawing room of India always gets special attentions. I personally do not like flyovers, as they disfigure the beauty. Parisian approach of building underpass is better to me. But building those may be more costlier and without proper planning it might be a nightmare after monsoon rain. Thanks to Election Commission that writing is banned on the wall and it had atleast kept our political parties away from the walls otherwise it would have been full of "hands", "lotus" and not to mention those "elephants" ,"hammer" and what not. But those walls are now left with poster from IIT coaching (ISO certified) to shoes. I always need a haircut as soon I reach India and when I fly out of India. One big benefit is the price but the primary motivation is the quality of the haircut. So I went with SK to a nearest hairdresser. The name of a normal haircutting saloons are not normal any more rather very fashionable like "copper clips" or "silver scissors". I should have met guys who are coming up with innovative names before I registered santm.com. A simple haircut which cost 15 rupees for my dad and he thinks that is expensive the same costs to me Rs 60. But unfortunately this place does not even have AC to call it a "Men's parlour". With all said and done the reason for typing so long was as I noticed a 19/21 years old boy quite FAT to my eyes was getting pedicure. Instead of getting those pedicure and wasting his money he should have joined a GYM or rather do some walking. I don't know how getting a pedicure is making him better marketable. Well, it might be very personal view which might not be shared by others as the first thing that you need is money and it looked like he had a lot. One thing I noticed in India for affluent class it means to be overweight, having big tummy (men particularly) as they intake lot of rich food, do less physical work and for every daily chores they have a domestic helper. May be time has now come for educated Indians to understand the values that comes with money and luxury. Second thing is the number of mobile-phone users in the country is experiencing a meteoric rise. Right from Sabjiwali (vegetable seller), bai (helper), theleywala (cartpuller) to higher class is talking over that small e-gadget for hrs.....God knows what topic they are talking on.I think that day is not far when everyother person will be talking over phone rather then in-person.